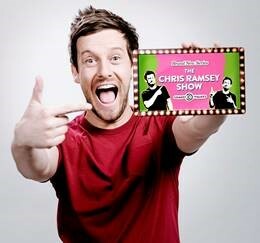 Bestselling stand-up and Celebrity Juice regular Chris Ramsey returns to Comedy Central for the second series of his hit show. Recorded weekly, Chris will take a look back at the weird and wonderful stories and viral content from the world of entertainment, celebrity and social media that have grabbed the nation’s attention and dissect the mayhem with the help of his two special guests who have joined him on the sofa. Special guests already confirmed include Iain Stirling (Love Island), Tom Davis (Murder In Successville) and rapper Example. To get on the guest list email ramseytickets@avalon-entertainment.com with your name, the date you would like to go, and the number of tickets you require. You will have guaranteed entry tickets provided you arrive BEFORE 6:45pm on the day of the show.